Preparing for (and then passing) the test is only the first step in getting your child into the perfect NYC Gifted and Talented school. Most of the 32 NYC districts offer a gifted and talented program, in addition to the 5 citywide schools. This page will focus on school location, programs, accessibility, and other factors that will influence which school you should apply to for your child. For more information on the NYC Gifted and Talented program, including admissions, visit our NYC Gifted and Talented Program page. 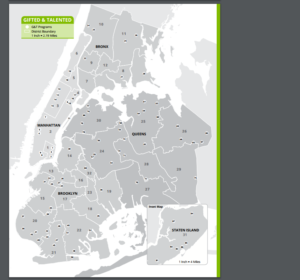 For more information on the NYC Gifted and Talented Test, view our NYC G&T Test Overview page. Most school districts in NYC offer a gifted and talented program. Schools in the district have separate academic classrooms for students identified as gifted and talented; certain non-academic classes, like gym or art, may have a mix of students in G&T and general education classrooms. Below is a map of the district wide schools. Admission into NYC Citywide schools requires a score of 97 on the NYC Gifted and Talented Test. Every classroom in these schools is a gifted and talented classroom; there are no general education classrooms in these schools. The one exception is P.S. 77, Lower Lab School, which is a District school that acts like a Citywide school. In recent years, only students with scores of 99 have gotten in to Lower Lab. The Anderson School (Citywide) has an advanced math program, with fast-paced instruction, which encourages students to discover new approaches to math problems. The 30th Avenue School in Queens has excellent engineering and technology teachers, and students learn computer programming and even get to play with Lego robotics. S. 166 Richard Rodgers School of the Arts and Technology works closely with the Teachers College Reading and Writing Project to emphasize writing. If your child has scored either 90 (district minimum) or 97 (citywide minimum) on the Gifted and Talented Test, then your next step in the G&T admissions process is to apply for specific schools. On your application, you will list, in order, your preferences for where you want your child to go to school. If your child receives an offer to a particular school, they will not receive additional offers to schools further down on the priorities list. Research schools online: The DOE G&T Handbook offers information regarding location, public transportation, accessibility, special programs, etc. An easier way to navigate this information is available on Inside Schools, which lays out the information in an easy to process manner and lets you find schools by your address. Consider your child’s needs. Schools may not be fully accessible for students with mobility issues or may be lacking in special education programs. Most schools with a gifted and talented program offer team teaching (ICT) and English Language Learner (ELL) programs. Consider the school’s location. Will your child be able to get to school in timely fashion? Will time going to and from school affect extra-curricular activities? Consider your other children or your child’s friends. Sibling priority for admissions means that your child will be prioritized during the admissions process if you already have another child in the school you are applying to. You also may or may not want your child in the same classroom as some peers he already knows. Researching a school can only go so far. Your instinct and personal evaluation will impact your decision more than an online review or a friend’s opinion will. Here are a few tips for each school visit. TestingMom.com members get access to even more tips, and can always contact our parent success team for additional tips regarding specific schools in NYC. Overall Impression – Do you feel safe in the school? Are the facilities up to date? Is the building clean? Facts and Figures – How do students do on standardized tests? What is the student-teacher ratio? What is the faculty turnover? In the Classroom – Are the children engaged? Are teachers enthusiastic? Do kids work in small groups or large groups? School Philosophy – Is there a philosophy of the school and do you agree with it? How engaged are parents? Is there an active PTA?